The neww D&D Faerun Under Siege site has been launched. I am thrilled to see a Drow, Download the rules and get the new characters. Looks like we are getting another couple of dragons, an Ogre, and some new printed dice bags, instead of the old red and blue ones. And a collectors box to accompany this set!!!!!! Plenty of low cost BACs appear to accompany the set along with what looks to be a Ranger. Rules and Play Mat links are not working just yet. I will add them to SMCL as soon as I can download them. And a Playmat, looks like D&D is getting the full treatment this time around. OOooooo... i see a bard die on the box. White Dragon, Hell Hound, a Gnome of some sort, another Beholder perhaps, Gold Dragon? I want this set so bad. Green and white die has Minsc & Boo's icon but not stats. Interesting. It's also a bolt character and Minsc & Boo was a fist. Probably seeing it generally as a "ranger" icon. Also, the box art on the starter, is that Drizzt? 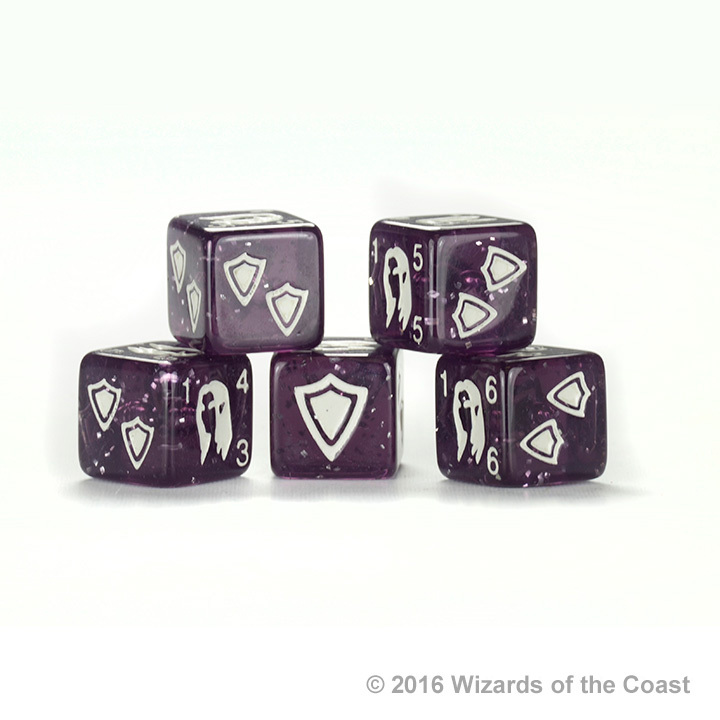 http://wizkids.com/dicemasters/wp-co...le-Dice2-1.jpg is it possible these die belong to Drizzt? I don't know much about D&D lorestuff, not really my thing. He's one of the few characters I know by name and from what I recall seeing on board game boxes that looks kinda like him. 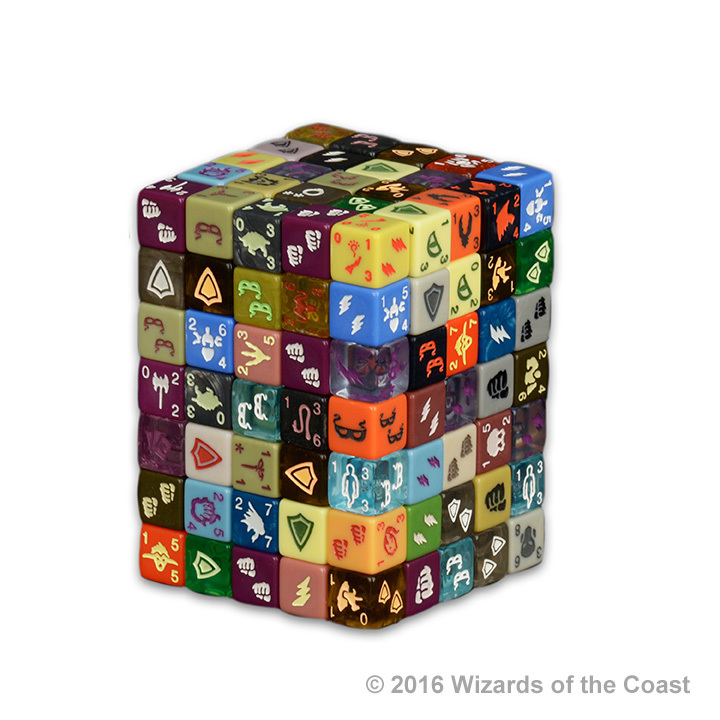 http://wizkids.com/dicemasters/wp-co...ge_Dice2-1.jpg bottom right on this picture could be a knight of some sort? I think the brown die a few above it might be a golem. See through ghost-thing die is pretty cool looking. I guess I have hype for this set just because more DM. Starter looks like brass/gold/cobolt dragon, cockatrice, glabrezo,hill giant, gnome ranger, half elf bard, hell hound, white dragon. Barkskin BAC. The side of the box has Lloth, bahamut, Dri'itz, balrog,another fiend(perhaps named demon Lord, Orcus? ), white dragon and brass/gold dragon. In the die stacks I see magic ring, deck of many thing (or maybe a divination spell), a new thief, Wizard, cube, beholder and many more I have good guesses for. The box art shows what appears that include a lich, lizard man, Hobgoblin, yeth hound, ghost/banshee. We have a Spider and with 7A/7D its gonna be a big one(SUPER RARE!). I see two different hands actually. The blue and purple one that appears to be on fire is probably a spell caster of some sort. A warlock maybe? The other one with the face is a thing I have no idea for. Die speculation: Beholder (blue die beholder symble), Bugbear (tan die "face"), Bard adventure (purple die lute symble),Rust monster (orange die looks like a blob thing trying to give you a high five), Gith (orange die head profile with pinytail). Some of these may have been metioned. Reposting my thoughts from a facebook page. Awesome news! Excited to see what we get from the set! Check my guesses on the front page. The Faerûn Under Siege collection expands deeper into the Dungeons & Dragons Forgotten Realms with new adventurers, monsters and keywords. Players will be excited to see the addition of well-known Dungeons & Dragons characters such as; the dark elf Drizzt, the legendary dragon Bahamut, the insidious demon-queen of spiders Lolth and the demon lord Orcus. I hope one of these is really Artemis Entreri. Really doubtful, DnD likes to go relatively nameless, and I'm betting that drizzt and the other 3 named folks are actually SRs. There was a prediction that the Sparkly Beholder die is Xanathar. I wonder if everyones Favorite Wizard is coming, Elminister? Agreed. The four named ones just be SRs like marvel zombies. Then another four more superrares for a total of 8, which is the new normal. The side of the box has the beholder card, not sure if we can read it sell enough, but I'm pretty sure it says beholder. The card on the side definitely does not begin with an X.
FYI, Tom Vasel said he's posting a review of the set this week. beholder vanilla, purchase cost 4, energy mask.